The Battle of Elizabethtown, which took place on or around 27 Aug. 1781 and essentially crushed the Tories' sway in the North Carolina's Cape Fear region, involved one of the great ruses in the state's Revolutionary War history. Bladen County was firmly in the hands of the Tories, or Loyalists, and British forces numbering between 300 and 400 men were headquartered in Elizabethtown. The Patriots, about 60 or 70 men, had been driven from their homes and seen their estates ravaged and their houses plundered or burned. Led by Cols. Thomas Brown and Thomas Robeson, the Patriots knew they would need to rely on cunning and strategy against the militarily superior Tories. Brown and Robeson devised a scheme in which the inferiority of their forces would be masked by false commands to "phantom" soldiers, intended to be heard by the enemy, to make the Patriot numbers appear greater than they were. Once the battle started, the Patriots went on the offensive, crossing the Cape Fear River and surprising the Tories into a disorganized retreat. The Tory commanders, John Slingsby and David Godden, were both fatally wounded, and their troops scattered into the darkness. Many of them plunged headlong into a deep ravine near the river, which has been known ever since as "Tory Hole." When the smoke of battle cleared, 17 Tories were either dead or mortally wounded. Not one Patriot was killed, and only 4 were wounded. In 1939 the state of North Carolina erected a historical marker on Main Street in Elizabethtown, memorializing the battle and the famous Tory Hole. R. F. Beasley, The Battle of Elizabethtown (1901). Bladen County Historical Society, Battle of Elizabethtown (1957). 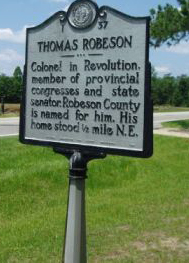 Thomas Robeson, NC Historical Marker, I-37. Image courtesy of North Carolina Office of Archives & History. Available from http://www.ncmarkers.com/marker_photo.aspx?sf=b&id=I-37 (accessed June 1, 2012). omg this helped me so much dat i got a freakin f on my prodject man what the heck why those blue lines.